Metal roof coverings have a long life span, however when defects start to appear on the covering it is important to either pay for good quality repairs or replace the covering. 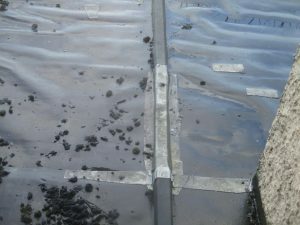 An example of poor quality repair was identified during a Full Building Survey in Fulham, London. Flash band has been used to repair the roof, this is okay as a short term solution but long term this is not appropriate and the roof will need to be properly inspected by a roofing contractor to advise on the appropriate actions.